Entertainment at wineries and vineyards in Sonoma County requires a unique set of skills that THEY improv has developed over years of successful events throughout Northern California. We have a variety of options to entertain most any group in Sonoma County and the rest of the county. With improv comedy, stand-up, game shows, murder mysteries, Emcees and fun characters, there's virtually no limit to our ability to enhance your Sonoma County winery events. The vineyards and wine rooms of Sonoma County are convenient to the San Francisco Bay area and have been very popular for weekend getaways from the big city as well as a beautiful backdrop for destination weddings. We bring great options for entertaining such family events. Further, companies come to Sonoma County to get away from the city or Silicon Valley to help to bond employees while getting away from the stress of the office. We have many team building options that we can discuss with you. Throughout Sonoma County, there are many great areas to serve your needs including in Alexander Valley, Bennett Valley, Chalk Hill, Dry Creek Valley, Forestville, Glen Ellen, Graton, Green Valley, Guerneville, Healdsburg, Knights Valley, Northern Sonoma, Petaluma, Rockpile, Russian River Valley, Santa Rosa, Sebastopol, Sonoma Mountain,Sonoma Mountain, Windsor. 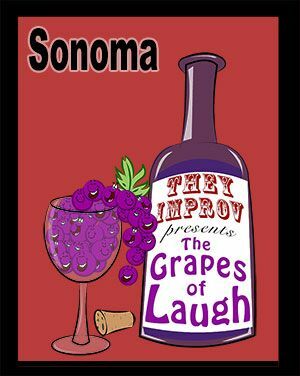 For more information on prospective venues you can visit the Sonoma County website. Simply contact us to find out how The Grapes of Laugh can come to your venue in Napa. This includes working on single events for private clients or for regular public shows that can bring attention and guests to your venue.